Whether you’re weaving a rug, a blanket or a scarf, you must properly finish the ends in order for the project not to come unraveled over time. How you choose to finish the project is largely a matter of personal taste: you can have long fringe or no fringe, and can add decorative ties or braids to embellish plain pieces. Tying or braiding the warp threads is the quickest and easiest way for beginners to finish a weaving project. Count your warp threads, which are the base strands on the loom through which you weave the pattern with the weft threads, so that you can divide the warp strands evenly into knots or braids. For instance, 32 warp threads can become eight knots with four strands each, while 27 warp threads could become nine braids of three strands. 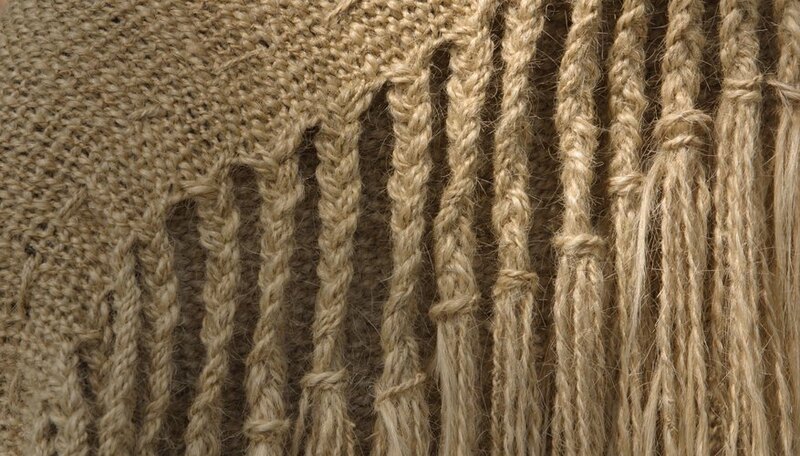 Cut the first few warp threads — for instance, three strands, if you intend to braid the fringe — beginning on one side of the weaving. Leave the remainder on the loom so that it stays tightly woven, and cut a long fringe so that the project has no chance of unraveling. Tie an overhand knot by looping the group of warp threads and running the thread ends over, under and up into the loop. Pull to tighten the knot, making sure that the knot is as close to the weaving as possible. Or you can braid three strands by crossing the far right over the middle strand, and then cross the far left over the middle strand. Repeat the braiding pattern until the fringe reaches your desired length and tie an overhand knot to secure the braid. Cut the next batch of warp threads and repeat the braid or knot. Continue cutting and tying or braiding until you’ve braided or knotted the entire side of the weaving. Repeat with the other end of the project, making sure to push the woven section tight before braiding or knotting. You can use a fork or wide-toothed comb to push the woven threads together. Cut all fringe to your desired length, once the entire weaving is secure. Secure the woven ends even further by stitching back and forth across the end rows with an embroidery needle threaded with your weft thread. Bring the needle up two or three rows below the end. Loop the thread over the end, between two warp threads, to come back up two or three rows down and two or three threads over. Use this method if you want minimal fringe. Add a decorative detail to the end of your project by bringing the knotted fringe or braids together. For instance, number the braids, and then join braids one and three together halfway down the fringe length to form a thicker braid. Join braids two and four together, braids five and seven together, and so forth. Or, join fringes one and three together in a second overhand knot to form a thicker fringe.